Blake Archuleta slings two touchdowns against Cathedral. (La Puente) Bishop Amat got a pick six from Devin Jarvis and a 52-yard punt return from Jaden Allen and took care of business at home with a 42-21 win over the visiting Cathedral Phantoms Friday night. To open the contest, Cathedral head coach Anthony Jefferson tried to surprise the Lancers by going to the onside kick. It appeared that kicker Omar Arrueta had recovered his own dribbling kick at the Bishop Amat 49. The officials didn’t see it that way and ruled Arrueta had touched the ball at his own 49 and that’s were the Lancers took over. Bishop Amat covered the 49 yards on six plays capped off with a 24-yard touchdown from Blake Archuleta to Daniel Garcia. The 7-0 lead would soon be extended as on Cathedral’s third play from scrimmage, Mekhi Jordan was picked off by the afore mentioned Jarvis who returned the inteception 28-yards to paydirt. Adrian Ochoa added the extra point and with four and a half minutes gone in the first quarter, Amat had the 14-0 lead. Terrence Simon Jr. bulldozed his way to two scores. The Phantoms got on the board four mintues later when all 6-1 and 230 pounds of Terrence Simon Jr. plowed his way across the goaline on a 14-yard run. Cathedral was forced to punt with just over eight minutes to play in the first half. The punt was fielded by Allen at his own 48. Allen escaped a couple of tackles early and got to the corner, turned up the sideline and was gone. Ochoa again added the point after to extend the Lancers lead to 21-7. Coming out of the locker room after half time, Bishop Amat decided to serve up a healthy portion of Kenny Collins on the ground. 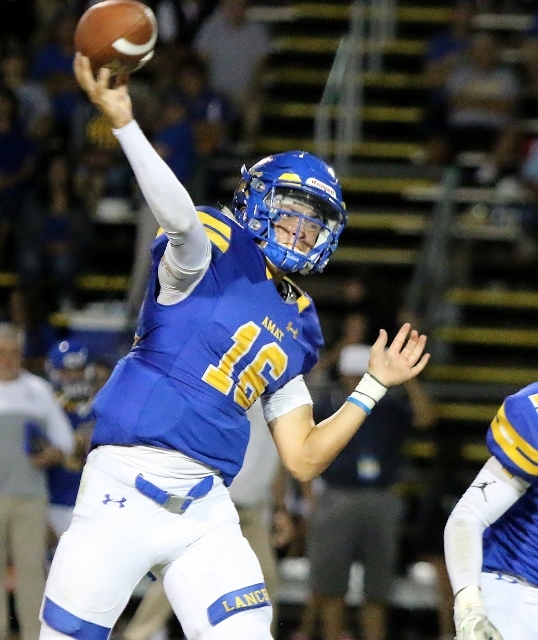 Lancer head coach Steve Haggerty saw his quarterback take some big hits in that first half and letting Collins loose was a way to dial down the pressure. Collins did jus that and finished off a five playe drive with a one yard plunge. Collins finished the night gaining 76-yards on 17 carries with the loan touchdown. The Lancers got on the board gains with 4:12 left in the third quarter. The big man Simon was at it again this time from nine yard away carrying numerous Lancer defenders into the endzone. The Phantoms went for two and Simon gladly took care of the conversion. Simon finished with 47-yards on nine carries and the two td’s. Bishop Amat got two more touchdowns on a 26-yard run by James Henriquez and Archuleta’s second TD pass to Garcia. Cathedral’s final score came on a 32-yard pass from Jordan to Jackson Dadich. Jordan finished the night hittin on six of nine passes for 105-yards, one touchdown and the one costly interception. Archuleta completed 13 of 22 passes for 163-yards and the two scores. 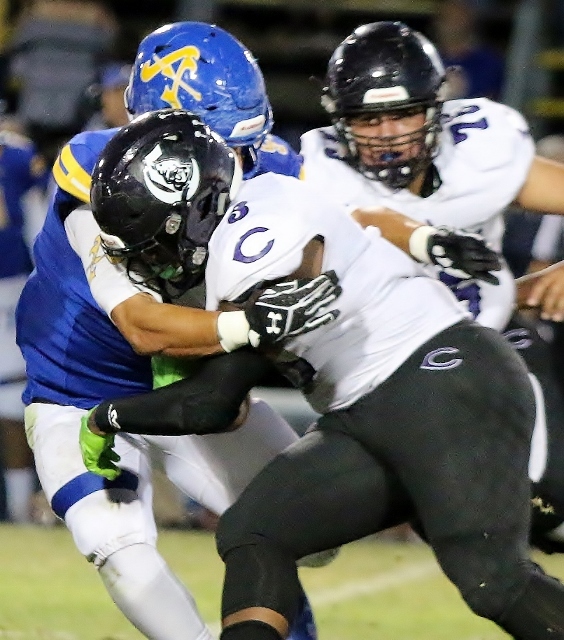 Cathedral will return home and get ready for another tough test in Serra while Bishop Amat will open league play next Friday on the road against Chaminade. 4 Comments to "Defense and Special Teams Key Lancer Victory"
Hey Moreover you may want to think again on this one. Amat can actually compete and beat good teams in the upper divisions, The Amat fans mindset is not so delusional when they think they have what it takes to upset the Trinity league teams, been done many times by the Lancers. As for Cathedral fans thinking their team could beat Amat, you never know in any given year, but it hasn’t been done in recent times. 2009 – Amat beat Trinity third Place Mater Dei 28 to 21 in playoffs. 2016 – Amat beat Servite and J Serra. I’ve been one to lay the wood to Cathedral when the opportunity arises, so I recognize the behavior of Amat as being one and the same with that of the Phantom crowd. See, Cathedral thinks it can hang with Amat, and Amat figures it has what it takes to upset the Trinity programs. Both mindsets are equally delusional, and lead on occasion to sophomoric acts such as the MVS sideline banishment. By the way, from the deafening silence we’re getting from Phantom followers today, you’d think THEY had been banished from this site. Seeing as Fred and Aram’s blog is on life support this is the the BMOC. The rabid Bishop posters have been wandering in the wilderness for 40 years. Maybe they will find the MVS as the promised land. WHAT?? Since when does MVS cover Bishop? Obscene. Team has persona non grata on here forever.Joe must have spilled his Ovaltine when he read this. From Duane B.: Since the game is with a team we cover with regularity in Cathedral! For the record, it’s not so much that Amat is persona non-grata here, it was Amat who told one of our writers to leave their sideline because no one from Amat read us anyway! Oh, and I think Joe leans more Nestle Quik than Ovaltine!